Shortly after the popular religious program Ang Dating Daan celebrated its 31st year anniversary last month, the program hosted by Bro Eli Soriano was named the Best Religious Program of the Year by the Gawad Amerika Awards. In 2006, Ang Dating Daan received the “Most Informative Religious Program” honor from Gawad Amerika Awards, which is now on its tenth edition. This year, Ang Dating Daan won as Best Religious Program. 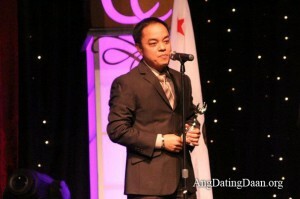 The awarding was held last November 5 at the Celebrity Centre International in Hollywood, California. Considered as one of the longest-running shows on Philippine television, the program now has its English, Portuguese, Spanish and Chinese versions. Its English-language version, The Old Path, is being aired in countries that include India, Australia, the Middle East, Europe, and Canada. In Central and South America, the program is known as El Camino Antiguo (Spanish) and O Caminho Antigo (Portuguese) respectively and are available in up to 20 countries in the said regions. The Old Path’s Mandarin version, on the other hand, is carried by Dream Satellite via TOP Channel in the whole of the Philippines and nearby countries. From its current reach, The Old Path started airing in the larger parts of India, Australia, Africa and the Middle East last November 1, 2011 through the direct-to-home facilities of Thaicom satellite. For viewers in the United States and Canada, the Galaxy 19 satellite delivers the program straight to viewers’ living rooms. In some parts of India, Middle East and Europe, The Old Path is carried through Hotbird satellite. Bro. Daniel Razon, the Vice Presiding Minister to Members Church of God International (MCGI), said in a Thanksgiving service that prior to radio and television, Bro. Eli used folk media, preaching town after town nightly in the province of Pampanga, north of Manila. Today, however, advancements in modern technology allows that the program can be watched in as many countries around the world using the facilities of satellite and the Internet, 24 hours, seven days a week. “We hope, with the help of God, the brethren, and our countrymen, that Ang Dating Daan will continue to air not only in the whole of the Philippines but with God’s mercy, in the whole world,” said Bro. Eli. “Like what we always say, if we are able to do something, and if there is any glory attained, it is always for God – to God be the glory!,” said the international evangelist. The Ang Dating Daan program is MCGI’s award-winning religious program whose title is based on the biblical verse Jeremiah 6:16.